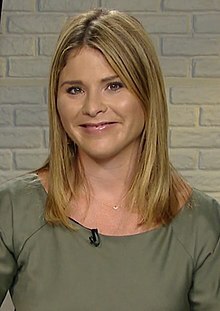 Jenna Bush Hager (born Jenna Welch Bush; November 25, 1981) is an American news personality, teacher, author, and journalist. She is the younger of the twin daughters of the 43rd U.S. President George W. Bush and former First Lady Laura Bush, and a granddaughter of the 41st U.S. President George H. W. Bush and former First Lady Barbara Bush. She is also the great-granddaughter of Senator Prescott Bush who was a United States senator from Connecticut, and the niece of Former Governor of Florida, Jeb Bush. She and her sister Barbara were the first twin children of a U.S. president and so far only twin first children. After her father's presidency, Hager became an author, an editor-at-large for Southern Living magazine, and a television personality on NBC, being featured most prominently as a member of The Today Show as a correspondent, contributor and co-host. On February 26, 2019, it was announced that Hager would replace Kathie Lee Gifford on the fourth hour of The Today Show later in 2019 after her departure in April. Hager was born at Baylor University Medical Center in Dallas, Texas, and named after her maternal grandmother, Jenna Hawkins Welch. While living in Dallas, she and her sister attended Preston Hollow Elementary School and then The Hockaday School. In 1994, after her father was elected Governor of Texas and the family moved to Austin, Texas, Bush was a student at St. Andrew's Episcopal School, and attended Austin High School from 1996 until her graduation in 2000. With her father becoming President in 2001, she attended the University of Texas at Austin and took summer classes at New York University. She was a legacy member of Kappa Alpha Theta, her mother's sorority. While there, Jenna and her sister Barbara made national headlines when they were both arrested for alcohol-related charges twice within 5 weeks: on April 29, 2001, Jenna was charged with a misdemeanor for possession of alcohol under the age of 21 in Austin. On May 29, 2001, Jenna was charged with another misdemeanor — attempting to use a fake ID (with the name "Barbara Pierce," her paternal grandmother's maiden name) to purchase alcohol. She pleaded no contest to both charges. Jenna Bush graduated from the University of Texas at Austin with a degree in English in 2004. Jenna Bush (second from right) witnesses her father taking the oath on Inauguration Day on January 20, 2005. She asked her father not to run for president in 2000: "Oh, I just wish you wouldn't run. It's going to change our life." Her father told her that he and her mother needed to live their lives. In the winter of 2003, however, she decided to become involved in the 2004 campaign. In response to this decision, she made media appearances during the summer of 2004 prior to the election. She and her sister made several joint public appearances, including giving a speech to the Republican Convention on August 31, 2004. She made headlines when she was found sticking her tongue out to media photographers at a campaign stop in St. Louis. Jenna and Barbara took turns traveling to swing states with their father and also gave a seven-page interview and photo shoot in Vogue. Before leaving Washington, D.C. in summer 2006, Hager worked at Elsie Whitlow Stokes Community Freedom Public Charter School for a year and a half as a teacher's aide. She took a leave of absence from the charter school position to work at a shelter as part of an internship for UNICEF's Educational Policy Department in Latin America, specifically Panama. After her internship for UNICEF, Hager returned to her position at the charter school in Washington, D.C. She currently works as a part-time reading coordinator at the SEED Public Charter School in Baltimore, Maryland, and contributes a monthly news story about education for the Today show. In 2007, Hager began marketing a book proposal with the assistance of Robert B. Barnett, a Washington attorney. The title of the book is Ana's Story: A Journey of Hope and it chronicles her experiences working with UNICEF sponsored charities in Latin America, including visits to drought-stricken Paraguay in 2006, while working as an intern for United Nations Children's Fund. HarperCollins announced in March 2007 it would publish the book and it was released September 28, 2007, with an initial printing of 500,000 copies. Her share of the profits will go to UNICEF; the remainder will go to the woman whose life is the basis of the book, assisting in the young woman's continuing education. During the book tour, Hager appeared on The Ellen DeGeneres Show; during the interview Hager telephoned her parents. Hager wrote a second book, in conjunction with her mother, designed to encourage children to read. The book, entitled Read All About It!, was published on April 22, 2008, also by HarperCollins. On November 26, 2012, Hager was named editor-at-large of Southern Living magazine. In August 2009, NBC hired Hager as a correspondent and contributor for the Today Show. As time has progressed, Hager's profile has increased on Today including filling in as the orange room anchor during the 7AM- 9AM hours and substituting for Kathie Lee Gifford or Hoda Kotb during the 4th hour. In April 2019, Hager began co-anchoring the fourth hour of Today with Hoda Kotb following Kathie Lee Gifford’s departure. Bush met Henry Chase Hager (born May 9, 1978) during the 2004 presidential campaign. They became engaged in August 2007. Before proposing, Hager asked President Bush for permission to marry his daughter. Their relationship became public when the two appeared together at a White House dinner for The Prince of Wales and The Duchess of Cornwall in November 2005. Henry Hager attended St. Christopher's School in Richmond, Virginia, and holds an MBA from the Darden Graduate School of Business Administration at the University of Virginia. He worked as a U.S. Department of Commerce aide for Carlos Gutierrez and as a White House aide for Karl Rove. He is the son of former Virginia Republican Party Chairman John H. Hager, who previously served as Lieutenant Governor of Virginia and as the U.S. Department of Education Assistant Secretary under George W. Bush. The wedding took place during a private ceremony on May 10, 2008, at her parents' Prairie Chapel Ranch near Crawford, Texas. On December 12, 2012, Henry and Jenna Hager announced on the Today Show that they were expecting their first child. Their daughter was born in April 2013, in New York City. A second daughter was born in August 2015. Unlike most of her relatives (but like her twin sister Barbara), Hager is not a member of the Republican Party. While registering to vote in New York, she mistakenly registered with the Independence Party of New York while meaning to declare herself a nonpartisan. In 2010, Jenna Bush Hager and Barbara Bush told People that they preferred not to identify with any political party, stating, "We're both very independent thinkers." Hager serves on the board of the Greenwich International Film Festival. Bush, Jenna (2007). Ana's Story : A Journey of Hope. HarperCollins. ISBN 978-0-06-137908-6. Bush, Laura; Bush, Jenna (2008). Read All About It!. HarperCollins. ISBN 9780061560774. Bush, Laura; Bush, Jenna (2016). Our Great Big Backyard. HarperCollins. ISBN 9780062468369. Bush, Barbara Pierce; Bush Hager, Jenna (2017). Sisters First: Stories from Our Wild and Wonderful Life. New York: Grand Central Publishing. ISBN 9781538711415. OCLC 972386724. ^ a b "Jenna Bush Biography: Writer (1981–)". Biography.com (FYI / A&E Networks). Archived from the original on January 9, 2017. Retrieved January 9, 2017. ^ Bauder, David (August 30, 2009). "Former first daughter Jenna Bush joins `Today'". Victoria Advocate. Associated Press. Archived from the original on December 24, 2013. Retrieved December 15, 2012. ^ Lou, Shane. "Jenna Bush Hager joining Hoda Kotb as co-host of 4th hour of TODAY". Today. Retrieved February 26, 2019. ^ a b Wehrman, Jessica (August 30, 2004). "Jenna, Barbara to be seen and heard". Scripps Howard News Service. Archived from the original on October 18, 2012. Retrieved August 30, 2009. ^ Schumer, Fran (August 3, 2003). "Blackboard: School Choice; Where They Send Their Own". The New York Times. Archived from the original on November 10, 2012. Retrieved October 19, 2007. ^ "Bush daughters in Texas". USA Today. May 31, 2001. Retrieved May 2, 2010. ^ "Sentence for Bush daughter". BBC News. June 8, 2001. Archived from the original on April 1, 2012. Retrieved May 2, 2010. ^ Walsh, Joan (May 31, 2001). "The first family's alcohol troubles". Salon. San Francisco. Archived from the original on May 9, 2014. Retrieved May 2, 2010. ^ "Jenna Bush: Didn't Learn Her Lesson?". The Smoking Gun. Turner Sports & Entertainment Digital Network. 2001. Archived from the original on June 5, 2011. Retrieved May 2, 2010. ^ a b "All In The Family". Newsweek. November 15, 2004. Archived from the original on October 4, 2012. Retrieved August 30, 2009. ^ "Remarks by Barbara Bush & Jenna Bush to the 2004 Republican National Convention". The Washington Post. August 31, 2004. Retrieved January 24, 2007. ^ Alberts, Sheldon (August 16, 2007). "Hard-partying presidential daughter Jenna on the bridal path". Canada.com. Archived from the original on November 5, 2012. Retrieved August 18, 2007. ^ Argetsinger, Amy; Roberts, Roxanne (July 3, 2006). "First Twin Jenna Bush may leave D.C. social scene". The Washington Post. Archived from the original on October 12, 2012. ^ a b Getlin, Josh (March 6, 2007). "Jenna Bush to pen book on single mother with HIV". Los Angeles Times. Archived from the original on May 12, 2014. Retrieved March 7, 2007. ^ Hollandsworth, Skip (November 1, 2007). "Girl Gone Mild". Texas Monthly. Archived from the original on October 29, 2007. ^ Harris, Rachel Lee (August 30, 2009). "Familiar Face on 'Today'". The New York Times. Archived from the original on May 15, 2013. Retrieved August 31, 2009. ^ Paul Bedard (January 19, 2007). "Washington Whispers". U.S. News & World Report. Archived from the original on January 16, 2013. Retrieved January 20, 2007. ^ Maul, Kimberly (September 30, 2007). "First Daughter Jenna Bush Promotes New Book". Fox News Channel. Associated Press. Archived from the original on May 13, 2014. Retrieved May 9, 2014. ^ Kelly, Keith (January 20, 2007). "1st Book For First Daughter". New York Post. Archived from the original on December 22, 2008. Retrieved February 4, 2007. ^ Johnson, M.L. (September 11, 2007). "Jenna Bush Does Well With Kid Book". Associated Press. Archived from the original on December 26, 2008. Retrieved September 12, 2007. ^ Minzesheimer, Bob (March 6, 2007). "Jenna Bush embarks on book 'Journey'". USA Today. ^ Thompson, Bob (September 30, 2007). "Jenna Bush talks about book, rumors Interview covers war, wedding". The Washington Post. ^ "Jenna Bush Rings Up Dad on 'Ellen' Talk Show". Breitbart TV. December 5, 2007. Archived from the original on December 22, 2008. Retrieved December 5, 2007. ^ "Ellen has guest Jenna Bush call dad". United Press International. December 5, 2007. Archived from the original on December 24, 2008. Retrieved December 5, 2007. ^ a b "Jenna Bush dishes on her May 10 wedding--She tells Vogue magazine about her gown, the location". MSNBC. April 15, 2008. Archived from the original on October 15, 2008. Retrieved April 22, 2008. ^ Puente, Maria (November 26, 2012). "Jenna Bush Hager gets 'Southern Living' job". USA Today. Retrieved November 27, 2012. ^ Argetsinger, Amy; Roberts, Roxanne (August 17, 2007). "Jenna and Henry: Now They're Really, Really Official". The Washington Post. Retrieved August 17, 2007. ^ MCT (August 20, 2007). "First daughter Jenna Bush announces engagement to longtime boyfriend". The BG News. Archived from the original on December 21, 2008. Retrieved August 20, 2007. ^ "Jenna Bush engaged to be married". Daily News. New York. Associated Press. August 16, 2007. Archived from the original on November 13, 2013. Retrieved December 12, 2012. ^ Duerson, Meena (December 12, 2012). "Jenna Bush Hager: 'I'm pregnant!'". The Today Show. Archived from the original on June 3, 2013. Retrieved December 12, 2012. ^ "Jenna Bush pregnant: confirmed on 'Today'". New York Post. December 12, 2012. Retrieved December 12, 2012. ^ Nathan, Sara (December 12, 2012). "My grandkid can call me Sir! Former president George W Bush and his wife Laura are thrilled as their little 'popsicle' Jenna Bush Hager confirms she's pregnant". London Daily Mail. Archived from the original on April 20, 2013. Retrieved December 15, 2012. ^ AP (April 14, 2013). "George W. Bush becomes a grandpa". USA Today. Retrieved April 14, 2013. ^ "Jenna Bush Hager Gives Birth! Today Show Correspondent Welcomes Daughter Poppy Louise Hager". E!#E! Online. August 14, 2015. Retrieved August 14, 2015. ^ Katz, Celeste (September 3, 2014). "Exclusive: Ex-Prez' daughter Jenna Bush Hager mistakenly registered with NY's Independence Party". New York Daily News. Retrieved April 2, 2016. ^ Sobieraj Westfall, Sandra (May 17, 2010). "The Bush Twins On Their Own". People Magazine. Retrieved April 2, 2016. ^ Campbell, Colin (September 4, 2014). "George W. Bush's Daughters Are Not Republicans". Business Insider. Retrieved April 2, 2016. ^ Chumley, Cheryl K. (September 5, 2014). "Bush daughters decline Republican label: 'We're both very independent'". The Washington Times. Retrieved April 2, 2016. ^ Heins, Barbara (April 20, 2014). "Actors Michael Imperioli, Deborah Royce Join Greenwich International Film Festival Board". Greenwich Patch. Wikimedia Commons has media related to Jenna Bush Hager. This page was last edited on 19 April 2019, at 02:36 (UTC).